I have no idea where my daughter got her love of horses from. I've never ridden and know next to nothing about horses. 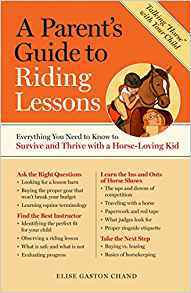 So I was thrilled to get a review copy of A Parent's Guide to Riding Lessons. It's a terrific, very readable guide for parents like myself who are just trying to keep up with their horsecrazy kids. It covers just about everything, from riding disciplines, to finding an instructors, to navigating the confusing world of horse shows. Descriptions are well-written and easy to follow. I really appreciate the fact that the author, Elise Gaston Chand, takes the time to include very basics (like black gloves versus white gloves - who knew?). And I love her approach to safety - no helmet, no horse. She seems realistic and practical, and has excellent advice on topics like leasing versus buying, and the reality of owning a horse. All around, this is an excellent book for the parents of horsecrazy girls. I wish I had read it earlier, but am very glad I am reading it now! Return to Share Your Favorite Horse Training Books!.